August 7, 2018 John B. Kupper D.C. There is a famous saying that an ounce of prevention can be worth a pound of cure. Nothing could be more true when it comes to the spine, especially the neck region. We often use the phrase “ a pain in the neck” to refer to difficult circumstances, people, and situations, while not realizing that this phrase is accurately describing real neck pain! It is true that some causes of neck pain are more difficult than others to prevent. On the other hand, there are many relatively easy things you can do to minimize your risk. One significant place to concentrate on is to look at how you sleep and what effect this is having on neck pain. One must remember that the upper neck is much more mobile than the rest of the spine. This affords increased versatility and mobility, however, at the expense of stability. Little muscles and ligaments are solely in charge of maintaining proper alignment and structural integrity. Most people sleep an average of 5-8 hours per night. Proper support of neutral spine position if absolutely crucial to both treating and preventing neck pain. Studies show that two sleeping positions are best for neck pain: on your side and on your back. If you are a back-sleeper, rounded pillows are able to contour to the natural lordotic curvature of spine and help relieve tension of muscles, ligaments, and joints. If you are a side-sleeper, keep your spine straight/neutral by utilizing a pillow that is higher under your neck than under your head. Sleeping on your stomach can be done correctly but is not recommended. Stomach sleeping puts abnormal stress on your spine and cause the neck to be rotated and put under additional stress. Understandably many people have sleeping position habits that are hard to break, plus not to mention that most people don’t wake up in the same position in which they fell asleep. However, it is important to start the night off sleeping either on your back or on your side in a neutral spine position. Remember that whatever pillow you choose to use, there will an adjustment period where you will need to get used to the new alignment. This may result in increased soreness for a few days up to 2 weeks. Neck pain typically doesn’t happen overnight and certainly will not be fixed overnight. The key is to identify probable causes and rectify them! Ice – Cryotherapy can reduce swelling to an area that is inflamed. It will also provide immediate pain relief and help essentially decrease the size of spinal nerve roots to create additional space. Hold a cold pack or frozen bad up vegetables wrapped in a towel and place on your neck. An accepted rule is 20 mins on (or until numb), 40 mins off and then repeat. Be sure not to place ice directly on skin in order to avoid skin burn. Neck Exercises – Gentle neck exercises can be a very effective tool to help loosen neck muscles. You may want to consider lightly moving your neck up and down and then side to side. Be careful not to over-extend you neck beyond its normal limits, as this is likely to cause damage. 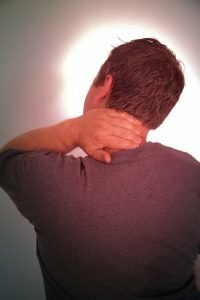 While there are very important things you can do at home to relieve neck pain, it imperative to know when it’s time to see a Doctor of Chiropractic for neck pain. Chiropractors are specially trained to understand the physiology and biomechanics of the body, especially the cervical spine. After a thorough assessment and X-Rays, the goal is to restore motion and alignment to the joints of the neck. Drugs and surgery are not recommended until conservative natural measures are taken. See your chiropractor for neck pain if…. Your neck pain and stiffness does not improve after a few days time. You are unable to look right or left with causing severe neck pain. You feel the need to use over-the-counter pain medications to mask the pain and just make it through the day. You are concerned that your neck pain has a deeper cause that needs to be addressed. The pain in your neck has now started to move down your arm and possibly causing pain/tingling/or numbness in your hand. Your neck pain is worst in the morning when you wake up and loosens up as you go throughout the day. In summary, if you are experiencing neck pain you must consider the pillow you are using, at home therapies you are utilizing, and also any underlying causes. For more information on neck pain from your Encinitas Chiropractor, visit our site at www.k2healthcenter.com. July 6, 2018 John B. Kupper D.C.